Lightweight, easy to put together, nice low height, very narrow (which is what I wanted for a sofa table). I did have to use build ups under a couple of my objects d’art so you could view them behind the sofa (boxes, books) but that wasn’t a hardship for me. I really love the clean lines of the piece and the fact it can stand alone as a hallway table, as well. A good investment. It's the new traditionalism: The Theodore console table's natural fir wood with reclaimed look and metal legs transform the stodgy notion of the traditional table with new rustic-chic industrial flair. Its fresh modern lines and geometric style breathe new life into interiors in need of an update without losing their classic touch. The table has two shelves which offer an amazing amount of space for displaying collectibles and necessities. Use the upper shelf for storing your bestsellers and showing off plants, while keeping the lower for favorite family photos. The plank-style appeal of this piece makes it perfect for placing everywhere from an entryway to your family room for a charming storage option. Dimensions 22.2 in. H. x 55.1 in. W. x 17 in D.
Was searching for the perfect TV stand for a 60 inch tv and this fit the bill. Slightly darker than pictured, but what I wanted. Read the other reviews about size, and though it was not a console table, it applied perfectly for the use intended. I bought this table as a space filler to go under a large wall sculpture. I'm satisfied with it for this purpose -- displaying books and decorative items. It is made of solid wood; and yes, the wood is quite a bit darker than shown. The photo is very misleading ( my reason for not giving it 5 stars). The assembly trick for aligning the holes: screw in the 3 leg pieces first, but don't tighten the screws completely. When you put in the V-bar, there will be enough wiggle room to get all the screws in. Finally, tighten everything. I made the mistake of buying this thinking it was a sofa table but its a CONSOLE table so its a lot shorter than I had wanted it. It till worked out well but I wish it was a little taller. This brand has several SOFA tables with a similar look so I would suggest getting those. Regardless, the overall look of the product was just what I wanted. It arrived quickly, in excellent condition and went together easily. The only reason I'm not giving this 5 stars is because of the metal V bracket in the back. The 3 drilled holes did not match up with the holes on the legs. Consequently, it is not secured at the middle/bottom joint. We don't plan on overloading it with books and heavy chatzchkies, so we'll live with it. But it looks very nice and it was extremely well priced. The screws don't line up with the holes needed to attach the legs and teh back V part. Beautiful piece, used it for my media center and it perfectly fits a 60" tv, speakers, and all my other dumb little techno boxes. The assembly instructions could be clearer but is fairly simple to build by inspection. The wood is a darker color in person and doesn't look as "raw" as the product image. I am using this table in front of my dining room windows for my potted plants that need to come in for the winter. This table was very easy to assemble and everything fit as it should. We took another reviewer's advise and loosely attached the legs before adding the "V" bar in the back and then tightened everything up. It feels very sturdy. I am not in love with the finish on the metal, but you could always spray paint the metal to the color of your liking with the appropriate paint. Overall, I am glad we bought this console table and it is perfect for our space. 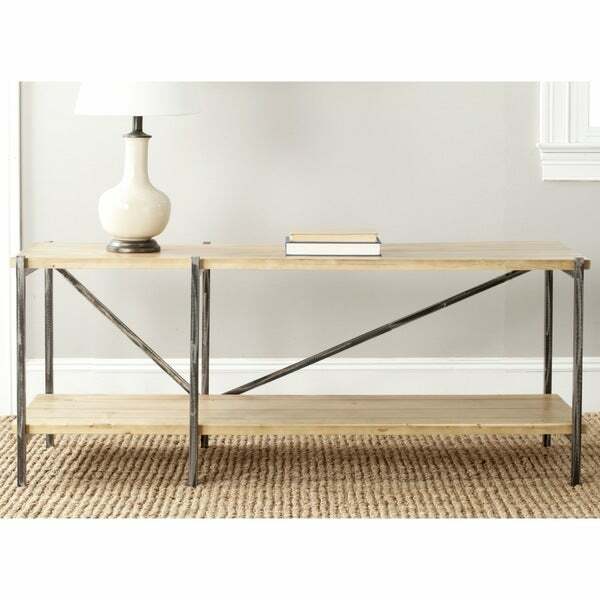 The console table arrived just as pictured and described. It's the perfect height for lower modern style sofas! First let me say the table looks nice. The metal legs are a bit too shiny, but that's alright. The one flaw which made me return the item was that it could not be placed flush against the wall. I tried in several spaces. This is even more true when you are placing it against some base molding. Overall, it looks very nice, however. Really great design. Highly recommend. beautiful table, we had to return as the item was really challenging to put together. The material used was great and would would have loved to have kept. I bought this for my entry wall. I put mail baskets on the bottom shelf and a lamp and key bowl on the top. easy to assemble, took maybe 20 mins. the color is slightly more orange than the photos, and I was hoping for more of a natural look. Still a great solid piece and I get lots of positive comments. The table goes very well with the rustic chic of a country style home or an urban setting. The wood looks rustic and the metal is a matt steel frame. It is easy to assemble and is very versatile. Safavieh Theodore Natural Console Table. Shipped Within The Estimated Time frame issued at checkout. Arrived issue Free. Thanks so much for a great purchase! The color is a very warm yellow. Almost orange. Not rustic Ike I thought. We haven’t even assembled it yet Bc out of the box we just aren’t sure of this color in our room. Wood not quite as pictured, but not terrible. It's wood, so that's a plus in today's world. However, it's not as blonde as pictured. It's more latte and has a glaze over it. Eventually I plan to dismantle it and paint it or strip and stain, but for now I'm living with it. I picked it up for a great price so I'm very happy for what I got. It went together very easily because my 15 year old did it, lol. I love that it hold my flatscreen 40" apx. and tons of books and other decorations nicely with rooms for art above. The steel gets lost, a nice detail that really no one can see. I think if I were to whitewash the wood then the steel would stand out better or if it had been blonde as pictured, but it isn't. Hope that helps. Side note, it is slightly lower than my previous TV console, but it wasn't too hard to get used to. It's in my bedroom and directly in front of bed; still visible even laying down in a large room. "How long in this console?" It is approximately 55 inches wide. Unique look and long length for a long sofa; a hard to find piece not found elsewhere especially at this extraordinarily good price! "How can I contact a reviewer to explain how he/she can solve the problem of the misaligned holes?" Hello Diann N., unfortunately, there is not a current way to contact a reviewer. Thanks for shopping with us! "hi there -- is this made of solid wood or manufactured wood products? also, what are the interior dimensions (space between shelf and top; interior width of both sections). thx." Hello zizland, it is made of solid wood (Fir wood).The total height is 22.2 inches. Unfortunately, we do not have the measurements for the interior dimension. Thank you for shopping with us. "what is the weight limit for the table?" Hello cruzing, we do not currently weight test items. We apologize for any inconvenience. Thank you for shopping with us. "Hello, I'd like to ask if there is a return shipping fee? Is this free shipping both ways?" Hello thao t., you would be responsible for return shipping unless the order is damaged, wrong, etc. Shipping costs are based on weight. Please let us know if you have additional questions. Thanks for shopping with us. "length & height is what I need. When will this Safevieh console Item #: 15216991 be back in stock? I'm anxious to know. thanks"
Hello xcuseme, Items are restocked as they become available; however we cannot guarantee an Item will be restocked. Thank you for shopping with us.